2020 Democratic presidential candidate Beto O'Rourke drew Trump's fire for his enthusiastic hand gestures. CNN's Jeanne Moos reports on the most active arms in politics. Why do commentators and political talkers refer to candidates by their nicknames alone -- "Beto" or "Bernie" -- instead of using their more formal surnames? The fear is that by referring to candidates so informally, pundits and analysts imply a familiarity that is inappropriate. The admonition was prompted by the case of O'Rourke, whose birth name is Robert but who goes by the nickname he's carried since childhood, Beto. As his national star rose during his unsuccessful race for the US Senate last year, his last name became superfluous. That got me thinking about what it takes to attain this rarefied status, and what it means. Does the fact that Beto or Bernie are instantly recognizable names in our politics suggest anything about the viability of the candidates who bear them? It is remarkable that O'Rourke, a three-term former congressman, has emerged from the rubble of a losing Senate race against Ted Cruz to become a highly anticipated challenger for the presidency. But the lanky former punk rocker touched a chord far beyond his state with an unorthodox campaign that relied heavily on his constant interactions with voters in Texas and with followers online. 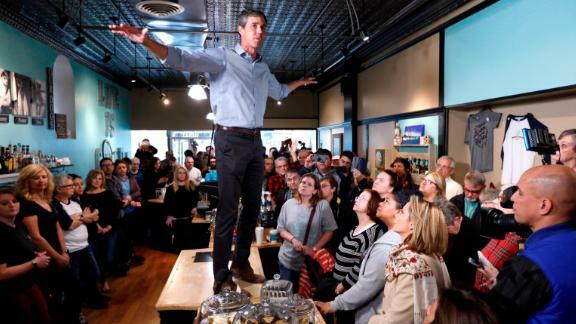 Preaching a message of unity and reconciliation that resonated with many in the discordant age of Trump, O'Rourke took an ever-growing social media community along with him on his seemingly quixotic campaign against Cruz. Moment to moment, he shared the highs and lows -- his events, personal exchanges and his innermost thoughts. That openness and transparency have helped make him a particular favorite with younger Americans, who have little patience for the smallness and contrivances of today's public debate. The result has been a staggering $80 million in contributions and a national following of supporters for whom the name Beto came to mean a better politics. Though different in style and tone from O'Rourke, Sen. Bernie Sanders engendered a similar reaction from his rabid base of supporters in 2016. Reciting themes and advocating for major social and economic changes he has championed for decades, the shambling, tousle-haired septuagenarian became the unlikely tribune of young Americans weary of what they viewed as calculated politics and incremental change. If early polling and staggering fundraising receipts are any indication, the base Sanders built in 2016 in his primary campaign against Hillary Clinton remains strongly committed. They're still on the Bernie bandwagon. The names Beto and Bernie are more than shorthand. They are brands that speak to authenticity and connection. None of this is to say that either will emerge as the nominee. Talented as he is, O'Rourke still hasn't been tested under the unremitting spotlight of a national campaign. He will have to prove he can build a campaign organization equal to the task. He will be poked and prodded to go beyond uplifting rhetoric and policy generalities to prove he is up to the job. His unscripted and spontaneous nature will come hard against the reality of life as a prospective president. Sanders had the left largely to himself in 2016, and still lost to Clinton. This time, he has competition in a crowded field, including from Sen. Elizabeth Warren, whose long war on Wall Street and weighty policy prescriptions make her a particularly threatening rival for support from the populist left. Finally, there is another big shoe to drop. Former Vice President Joseph Biden, a well-liked and familiar figure in Democratic politics, remains an early front-runner should he enter the race. Yet one should not underestimate the power of candidates who require no last name.